SEVEN STONES In Trade Paperback! The good news for today (every day has at least some…) is that SEVEN STONES TO STAND OR FALL is now available in trade paperback format (that’s the large size paperback) in the U.S. and Canada! (It’s already out in the U.K., Australia and New Zealand.) The yellow cover is U.S./Canada; the blue cover is U.K./Australia/N.Z. If you haven’t come across this book yet—here’s a bit from the Introduction. 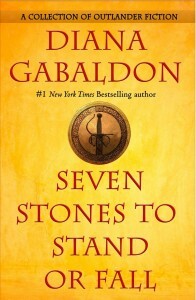 If you picked this book up under the misapprehension that it’s the ninth novel in the main Outlander series, it’s not. I apologize. So, if it’s not the ninth novel, what is it? Well, it’s a collection of seven…. er…. things, of varying length and content, but all having to do with the Outlander universe. As for the title… basically, it’s the result of my editor not liking my original title choice, Salmagundi. Not that I couldn’t see her point… Anyway, there was a polite request via my agent for something more in line with the “resonant, poetic” nature of the main titles. Without going too much into the mental process that led to this (words like “sausage-making” and “rock-polishing” come to mind), I wanted a title that at least suggested that there were a number of elements in this book (hence the “Seven”) and “Seven Stones” just came naturally, and that was nice (“stone” is always a weighty word) and suitably alliterative, but not a complete poetic thought (or rhythm). So, a bit more thinkering (no, that’s not a typo), and I came up with “to Stand or Fall,” which sounded suitably portentous. It took a bit of ex post facto thought to figure out what the heck that meant, but things usually do mean something if you think long enough. In this instance, the “stand or fall” has to do with people’s response to grief and adversity: to wit, if you aren’t killed outright by whatever happened, you have a choice in how the rest of your life is lived—you keep standing, though battered and worn by time and elements, still a buttress and a signpost…. or you fall and return quietly to the earth from which you sprang, your elements giving succor to those who come after you. So. This is (as the front cover suggests) a collection of seven novellas (fiction shorter than a novel but longer than a short story), though all of them are indeed part of the Outlander universe and do intersect with the main novels. Or check out my SEVEN STONES webpage for more buy-links and information. Thanks! This post also appeared on my official Facebook page on August 7, 2018. Why cant Jaime go to the future and get healing for that back. The main reason: Jamie is not a time traveller like Claire and their daughter. Congratulations! A friend recommended Outlander recently, and after hearing about the TV show I refused and said, “I’m no fan of romance.” But they insisted, saying, “Outlander isn’t a romance.” When I heard a bit more about the cool time travelling plot-line I was suddenly intrigued and now here I am checking out your website because I’m a new fan! Keep up the great writing! If you decide to read my books, begin with OUTLANDER, my first one. My “Chronology of the Outlander Series” webpage gives details of my Outlander series novels, Lord John novels, and short fiction, and how they are entwined. 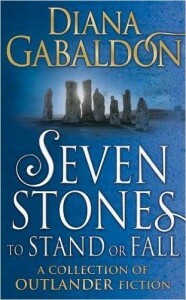 Just ordered and looking forward to Seven Stones….. wondering if this year is still the plan for number 9? I fully understand and accept the work involved and do not mean to be at all pushy…….. but…… Jamie and Claire have been running down that hill in my mind for an awfully long time …. and I hope they don’t fall…. I hope you enjoyed SEVEN STONES! I hope you have a great time in Scotland! It’s a beautiful country. I’m not one to post online. However, I am visiting your site to refresh myself on the order of your books in the Outlander series and had to express my joy in reading your books. Most books I will read once. There are a couple of authors that have written books I may read twice. I am currently working my way through your books for the fourth time. I appreciate the research and time you spend writing you books. I believe that is what keeps me coming back. Keep up the good work. I am reading this and I’m confused about Ian. Then realized you are talking about Ian the soon to be married to Jenny. Took me a while to realize you are talking talking about Ian the son of Jenny and Ian.